Though Samsung has been rather pivotal in making Android the most successful and widely adopted operating system in use around the world, the version available on smartphones like the Galaxy S4 isn't as pure as that found on Google's own devices like the Nexus 4. That's something Google is hoping to rectify with this new version of Samsung's flagship phone, which will be completely unlocked running a stock version of Android 4.2: Jelly Bean. While we certainly sang a lot of praises for the Galaxy S4 in our review, we found the additional features added to the core Android experience by Samsung "flawed or overly complex." Google is attempting to alleviate that issue by providing a more pure Android experience along the lines of its Nexus devices. Gone will be the added Air Gestures and Smart Scroll and Samsung's TouchWiz interface, all of which will be replaced with the core Nexus experience as delivered by Android 4.2. Additionally, the Google Galaxy S4 will include a fully unlocked bootloader, which bodes well for Android modders or developers keen to customize as much of the experience as they possibly can. Even more important, with the core version of Android, users will be able to upgrade to each new version with ease. That should come in handy considering it's widely expected Android 4.3 will make its debut during this week's Google IO (though this morning's keynote would have been prime time to roll it out). Based on what we know from Google's presentation, the foundation of the Galaxy S4's hardware will remain intact and unchanged. The Google Galaxy S4 should still get a massive 5-inch Super AMOLED HD display, backed by the 1.9Ghz quad-core Qualcomm 600 processor. The 13MP rear camera doesn't appear to be going anywhere either, and the same can be said for the phone's 16GB of internal storage. That said, the standard version of the Galaxy S4 loses a lot of that storage space to all the extra features included by Samsung. With Google stripping the smartphone of all the non-essential bells and whistles, it would appear its version of the Galaxy S4 will start off with much more than 9GB of free space out of the package. Google's version of the Galaxy S4 will also still support 4G LTE, as well as NFC, Bluetooth, GPS and Wi-Fi, and will still include the solid 2600mAh battery. The Play Store will be the only place you can purchase the new Galaxy S4, though the phone will be completely unlocked, and usable at both AT&T and T-Mobile in the U.S. Sadly, Verizon subscribers will be left in the cold when it comes to Google's own phones, even though the carrier is getting the Galaxy S4 later this May. 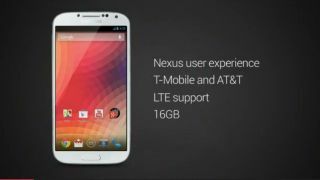 Unlike the Nexus 4, which also came completely unlocked, the Galaxy S4 will unfortunately not be quite as affordable. Beginning on June 26, Americans will be able to get their hands on the exclusive phone for $649 with no contract, which is $10 more than AT&T and $20 more than T-Mobile is charging for the Galaxy S4 outright. The price converts to AU$657 and UK£426. Part of what made the Nexus 4 so appealing, despite its lack of 4G, was the $299 (UK£239, AU$499) price tag, which without a contract, made it rather comparable to most competitor phones purchased through a specific carrier on contract.